The Street Glide is one of our favorite Harleys, because it has many of the features of the full dress bikes, without the bulk. It’s basically an Electra Glide with a lowered rear suspension, short windscreen and some custom appointments (color matched sagglebag latches and nicer trim). You’ve got the classic Harley batwing fairing, which provides good weather protection and plenty of information, including rpm and fuel level. The Street Glide includes a CD Player with weather band radio and an MP3 player input, with speakers built right into the batwing, great if you like your music when you ride (it can be a bit hard to hear at higher speeds because of wind noise). There’s usually cruise control on the Street Glide, which is feature we love on longer tours. Pillion comfort is good, although the passenger gets wide footpegs instead of floorboards (we like floorboards better for pillions, one of the reasons we prefer the Road King for two-up touring). One of the few things we really do not like about the Street Glide is the short windshield, which blows turbulent air right into the rider’s face. If you’re wearing a shorty helmet (most of EagleRider’s rental helmets are shorty btw) you will be cursing this screen, as every insect and stone will shoot right into your face. If you’re hiring a Street Glide, make sure to bring at least a 3/4 helmet with a faceshield…in fact, we’d recommend a full face helmet. Occasionally, we find the Street Glides in the EagleRider fleet have had the short screen swapped out for a taller one. 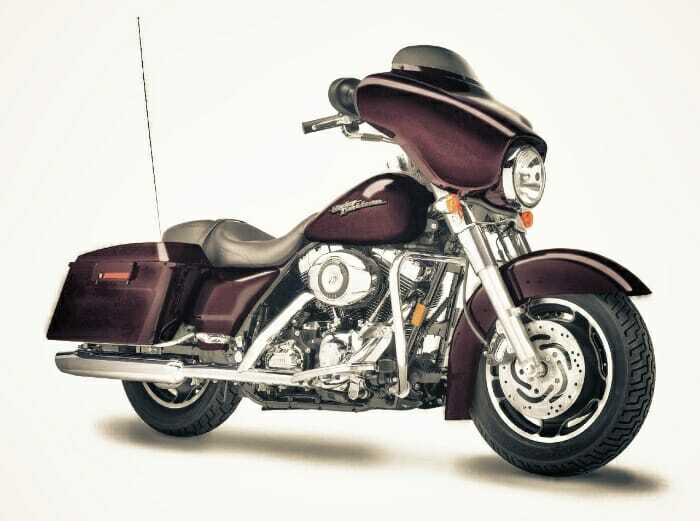 To achieve a “slammed” look on the Street Glide, Harley slightly lowered the rear suspension on the Street Glide, which gives it a bit less bump compliance (especially for pillions), and the turn in on corners is a bit lazier than for instance a Road King. Riders of shorter stature will find it easier to get their feet on the ground with the Street Glide. There’s a real dragster-type feel on the Street Glide, in a way it has a similar vibe to the Fat Boy, it’s hard to refer to a dresser Harley as a hot rod, but it applies here. Taxes, fees, helmet rental, basic insurance.